On Monday, we released new estimates of top incomes by state for 2012, based on the work done by Thomas Piketty and Emmanuel Saez. Coincidentally, Saez just released a preliminary update to 2013 of the national top income time series. Saez’s key finding is that the average income of the top 1 percent in the U.S. fell in 2013 by 14.9%. This decline at the top was large enough to lower overall average incomes in 2013 by 3.2%. The good news is, the bottom 99% saw their earnings climb—but by a very modest and somewhat disappointing 0.2%. 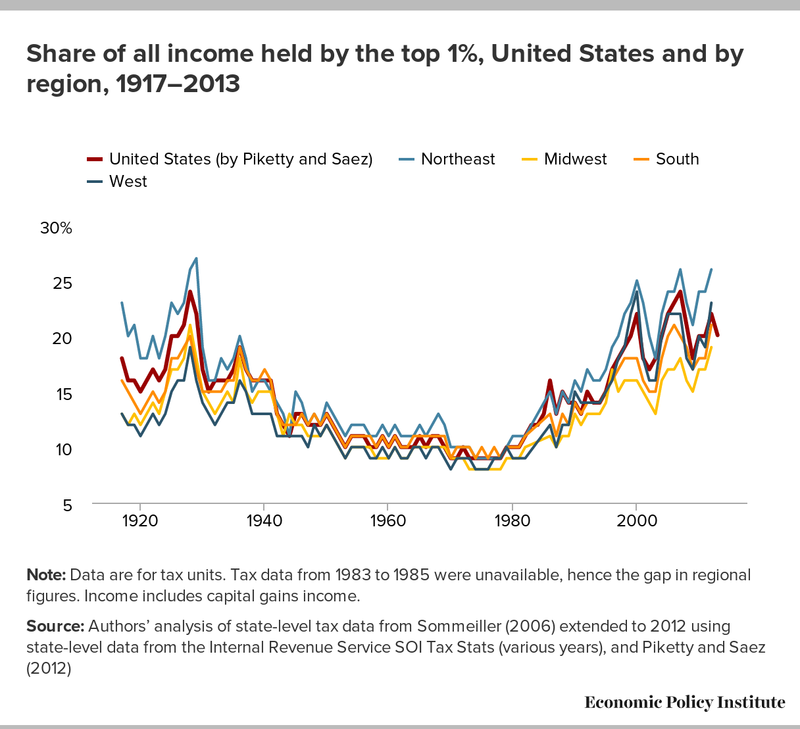 Illustrating that the top 1 percent really are different from you and me, Saez notes the fall in income at the top is due to high income earners shifting income from 2013 to 2012 in an effort to reduce their tax liabilities in anticipation of higher top marginal tax rates which took effect in 2013. In an earlier EPI analysis in October 2014, Lawrence Mishel and Will Kimball reported on the decline of wages among the top 1 percent of wage earners, which prefigured these results for households. Similarly, Mishel and Kimball also noted the changes in taxes and suggested this decline was probably only temporary. Saez expects top incomes to rebound in 2014, but fall short of their 2012 values. Indeed, James Parrott of the Fiscal Policy Institute noted in his summary of New York State top income trends (look up your state’s top income trends here) that data from the New York State Division of the Budget indicate that the top 1 percent’s share of New York personal income tax liability is expected to reach 42.5% in 2015—just shy of its 2012 value of 43.2%. So the bottom line is top income growth paused briefly in 2013, but all signs point to a return to growth when we get the data for 2014 and 2015. The bottom 99 percent experienced slight income gains in 2013, but given trends in wage growth it may be a while before we see much stronger gains in income for the rest of us. Note: Data are for tax units. Tax data from 1983 to 1985 were unavailable, hence the gap in regional figures. Income includes capital gains income.